April 2014 - While the JACE has the ability to route MS/TP traffic over one of its serial ports, handling the overhead of the BACnet MS/TP token passing protocol burdens the JACE's CPU. This results in increased CPU usage that could be used for other functions and calls for the potential need to change to a higher-powered JACE. The JACE CPU usage can be decreased by offloading the MS/TP token passing to external BACnet MS/TP to BACnet/IP routers. This is especially important if you require the JACE to be connected to multiple MS/TP networks. 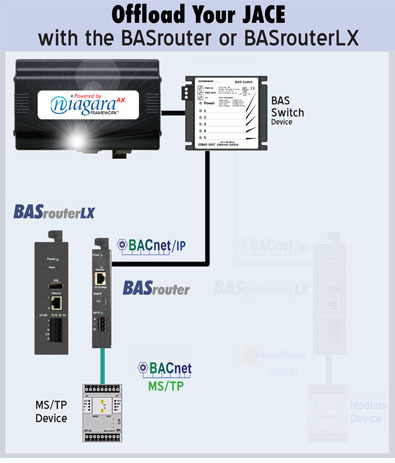 Both our BASrouter - BACnet® Multi-Network Router and BASrouterLX - High-Performance BACnet® Router provide the solution. The units offer stand-alone routing between BACnet networks such as BACnet/IP, BACnet Ethernet, and BACnet MS/TP - allowing the system integrator to mix BACnet network technologies within a single BACnet inter-network. In addition, the BASrouterLX provides a high-speed processor, with advanced features that include MS/TP slave proxy support (allowing auto discovery of MS/TP slaves), MS/TP frame capture and storage for use with Wireshark®. Up to 50 BBMD entries can be made.